Tower defense is getting quite the overhaul in 2013. Just last month we saw Anomaly 2, which turned the genre in reverse for a “tower offense” game. 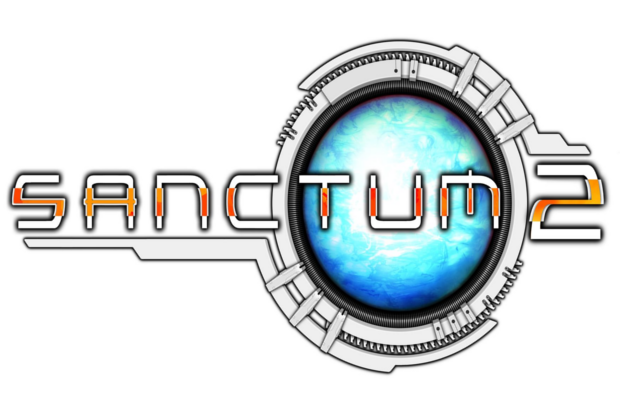 Now, Coffee Stain studios brings us another twist on what used to be a basic idea with the sequel to its popular PC game, Sanctum. Like its predecessor, Sanctum 2 sees the genre injected with a healthy dose of first person shooter elements. It’s a mixture that works out far better than it should have, and the result is entertaining, if rough around the edges. Cosmetically, this is a first person shooter, but it’s the tower defense that really makes up the meat of the experience. Each match is divided into enemy waves, during which the core must be protected. Between these waves, turrets and towers can be placed. At the outset of a level, the stage is blank and open, and pieces can be placed freely. Once the wave starts, it turns into a first person shooter where players must work together to repel the enemy waves with the help of the placed turrets. The trick is to place the towers (which automatically connect if placed on adjacent squares) in such a way that it creates mazes and bottlenecks for the enemies. Turrets, for their part, must be placed at strategic points to maximize the amount of time they’ll be firing at enemies. In addition to knowing where to place the turrets, it’s important to correctly balance resources. Is it better to keep placing turrets, or upgrade the existing ones? Maybe it would be a good idea to salvage a turret that might not be as effective anymore and get the resources back, which makes a new turret affordable. Each of the selectable characters is a bit different and sports a specific special ability and different type of weapon, whether it is a shotgun or assault rifle. More weapons are unlocked as players level up. Also unlockable is a robust selection of additional turret types (although you’ll likely only want to stick with the basic few) and perks which do anything from regenerating the health of the base’s Core to increasing damage dealt against enemies. All of these are selected before each match. Coffee Stain Studios made the extremely clever decision to highlight what each player has chosen for perks and towers, so that the rest of the players can choose something different to mix up the arsenal. Yes, “other players.” Sanctum 2 supports up to four players cooperatively, with seamless transitions into and out of a match. You may not notice that someone has joined you until you realize there’s another stream of gunfire aimed at the enemy. The game’s infrastructure runs smooth as butter, as well, with no lag to be found. The chat window at the bottom right of the screen is just hard enough to see, but anything that’s entered in is read aloud by a computerized voice, with frequently hilarious results (particularly if it tries to interpret an acronym or a letter in a word is missed). Single player is fun in the game, but it’s absolutely preferable to get some friends to join you. Sanctum 2 boasts a strong mix of enemy unit types. The standard “Walkers” are regular enemy units. “Walker Warriors” are very strong, larger versions of these guys that can jump, while “Armored Walkers” are alarmingly resilient quadruped tanks. There are also tiny exploding units, projectile-based “Screamers,” and tall brain-looking aliens evoking the look of Striders from Half-Life 2. All of these units have a “weak point,” which is understandably difficult to hit when the enemy is barreling towards you at top speed. These shootout sequences are thrilling and balance nicely against the tower building segments, which are comparatively relaxing (that is, until the clock starts ticking to the next wave). It’s a surprisingly intense game. Each round ramps up the action a bit, with higher numbers of more powerful enemies. Many of the stages have multiple spawn points, so each round could have enemies coming from two or more areas. Thankfully, each Build round will have the active spawn points highlighted with the numbers and types of enemies that will come through them. It’s a nice thought, but it doesn’t make the game more forgiving by any stretch of the imagination. Adding to the intensity, the difficulty goes up sharply by the final stage of each “world,” culminating in a Boss character that can freely trample and destroy turrets, towers and walls. This is in addition to the final wave of an 8-or-more-wave match with at least 20 enemy units flooding the battlefield. At times, it can be extremely frustrating, particularly with the sharp fluctuations in difficulty and mildly unbalanced enemies and characters, but achieving victory (usually just barely) is highly satisfying. An additional line of defense comes in the form of Conscripts, NPC soldiers that stand and shoot at the enemy. They can be helpful in providing a bit of additional firepower against the alien hordes. Unfortunately, they are unswervingly adamant about the former, and will never get out of harm’s way. That means that they will simply stand as a Walker takes a swipe at them, and will die in one or two hits. Additionally, turrets and towers, when placed, fall out of the sky onto the indicated space—crushing anything standing there. That means if you place a tower, and a Conscript (or you, for that matter) is standing on or too near to the space, he will be crushed. It’s amusing the first time it happens, but still annoying that you have to choose between losing a Conscript and not placing a tower where you want it to go. Another frustrating element is the lack of an intuitive interface, which will give first-time players some difficulty in working through the first couple of levels. Icons make sense after a while, but trial-and-error is the only way to learn some aspects of the game. The overall game design is rather elegant, so there’s not a mountain of mechanics to sort through, but I still missed important aspects of how to properly read the HUD in the first few minutes. Despite some hiccups in overall user interface and occasional balancing quibbles, Sanctum 2 is a mostly good hybrid of tower defense and first person shooter, and a very unique indie game. The genres blend together extremely well and Coffee Stain considered several elements that really streamline the combination and make for a fun experience that becomes even more fun when you bring some friends along.